Pentecost is one of my favorite writers, especially on prophecy. I strongly recommend his larger work, Things To Come and his work on the life of Christ, The Words and Works of Jesus Christ. 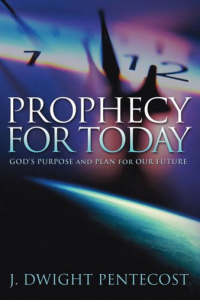 This book is a shorter work (about 200 pages) which takes the reader through a chronological picture of prophecy from the present until the very end. If you want a quick but thorough explanation of prophetic events from a dispensation, pretribulational, premillennial point of view, then get this book.